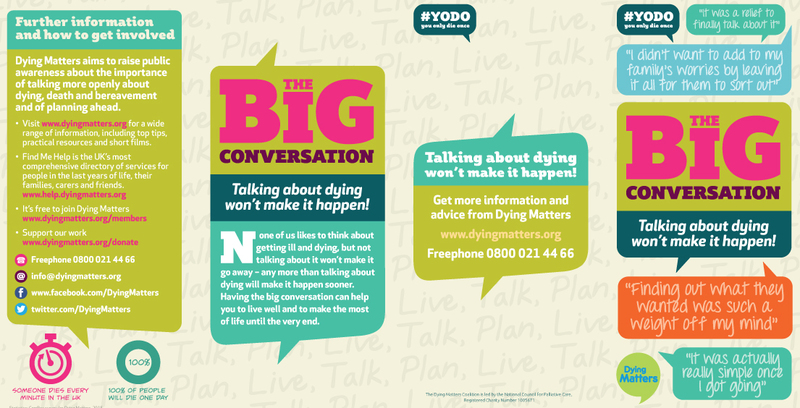 Monday is the launch of Dying Matters Awareness Week - we're encouraging everyone to talk to those important to them about their wishes surrounding death and dying. We've put together some information to help you start those important conversations. What to say, how to say it and where to find help­­­­. It's not always easy to know how to talk about dying. Awkwardness, embarrassment and fear means we tend to shy away from connecting with those who are dying or those who are grieving. But when we don’t talk about what matters it can increase feelings of isolation, loneliness and distress. In this section you will find practical guidance, information and resources on: how to say goodbye; the importance of good listening skills; and what the dying may experience as death approaches. There is also guidance on talking to children and young adults, and practical guidance on how to break bad news. It’s not only relatives and friends who might find it difficult to talk about what’s happening. The dying themselves often find it very hard to express what they are feeling or what they would like. Trusting the right person (a dying person may chose who they want to talk to, and this might not be a relative, trained nurse or doctor). The most important thing is not to push anyone into talking if they don’t want to. Just make sure they know you are willing to listen if and when the time is right. The following guidelines are aimed at relatives, friends and carers. But they may also be of help to anyone who is facing the end of life and doesn’t know how to reach out. People who are dying usually know what is happening to them. Nevertheless, when a dying person believes relatives and friends can’t cope with the truth, it can be hard for them to talk about what they’re experiencing or ask for what they want or need. This can leave them feeling isolated and lonely, not knowing how to reach out or say goodbye. So, how can a meaningful conversation happen? A dying person might sometimes help indirectly by throwing out ‘tester questions’ to check if you are willing to engage with them. They might, for example, ask you, ‘What do you think happens to you after you die?’ They might ask if you think there is life after death. They might ask, ‘Do you think God really exists?’. On the other hand, you yourself may want to broach the subject of death with your relative or friend, but don’t quite know how, especially if death has never been mentioned before. One of the easiest ways of opening up the subject is to ask your relative or friend who they would like you to contact if they became very seriously ill. This conveys that you know they may not recover and are willing to talk about it. It also gives them the space to decide whether or not to respond. If you don’t feel quite ready to have this kind of conversation and you’re in a hospital, hospice or care home setting, talk with the nursing staff so they can offer appropriate support. Be respectful: none of us truly knows what is going to happen after death, whatever our religious or spiritual beliefs. So it’s important not to force our viewpoint onto the person. This is their experience. Be honest: often in difficult situations we tend to search for the ‘right’ or clever thing to say. Or we deny what’s happening, or make a joke of it. While such reactions are very understandable – humour has an important place too, even in death – dying is a profound process that just needs us to be there, and perhaps hold a hand. The act of sharing ourselves openly and honestly can be very liberating and soothing for the dying person. Use engaged body language: don’t be afraid to look your relative or friend in the eye. Be alert and attentive to what they are telling you, and the way they are saying it. Listen to their tone of voice and be aware of changes to their facial colour; their willingness to engage with you; their willingness to meet your eyes. Watch their body language: is what they are saying really what they mean? Are they asking you something with their body language that they are not expressing with words? If so, invite them to tell you what they really want to say. Stay calm: you may also feel embarrassed by this kind of emotional intimacy, or fearful of seeing your relative or friend cry or become helpless and vulnerable. Breathe slowly to calm yourself. Keep grounded: ground yourself by physically feeling your feet firmly on the floor. This will help you to be present and accepting of what is happening. Try indirect questions, such as ‘I wonder whether there’s anything you want to talk to me about?’ or ‘Perhaps there’s something bothering you which you want to tell me about?’ or ‘What can I do to help you at the moment?’ This gives your relative or friend the choice to respond, or to say no. Providing choice is empowering. They may decline initially, but will know the door is open if they want to talk about it later. Indirect, exploring questions give the signal that you are safe to talk to, and that you care. Try leading questions: you can also gently ask leading questions to find out how they are feeling, such as, ‘If you become really ill, would you like me to sit with you?’ or ‘If you become ill, what medical care would you like?’ or ‘Have you ever thought about what you want to do with your belongings?’ or ‘Have you thought about what kind of service you would like at your funeral?’ Again, this provides the dying person with the choice to respond or not. Use short statements: these can also provide comfort. You might say, ‘If there ever comes a time when you want to talk about something or you feel frightened, please do tell me’. This gives your relative or friend permission to talk in his or her own time, without expectation. Don't fear tears: it’s okay to cry; crying is a natural response to emotionally charged situations. Being brave enough to express your grief can have a powerful healing effect on your relationship, as well as giving your relative or friend permission to grieve for the life he or she is leaving behind. Be quiet! Don’t feel you have to talk all the time. Just being there quietly at the bedside is important, and can often be surprisingly peaceful.